The Pink Stamper is having a color challenge! Here is my entry.. colors were green, pink, orange and brown! I welded together the popsicles on my Gypsy and they are from Doodlecharms. "Chill Out" is from Stamping Solutions. Wish me luck! I really hope I win.. winner receives her new cute Buggy Punnies stamps!! 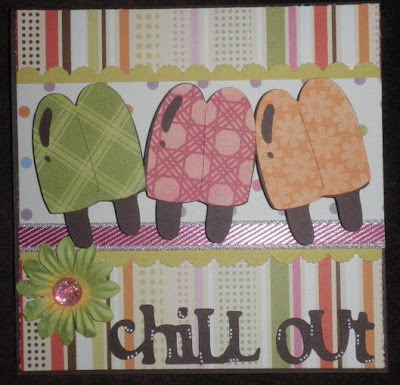 Love the shades of the colors you used - patterned popsicles look great! Love those fun colors and papers! Cupcake may or may not come out in August ;0) That's what I've heard but I dunno for sure. I love your popsicles! Too cute! oh my is this ever cute, adorable...have a fantastic weekend! WOW! Wonderful card. Love the colors. What a wonderful card, Candace! I love that you used patterned paper on the popsicles. It gives the card such a fantastic look. Great job!! WOW! The colors, just everything about this card is AWESOME!! Thanks for sharing!